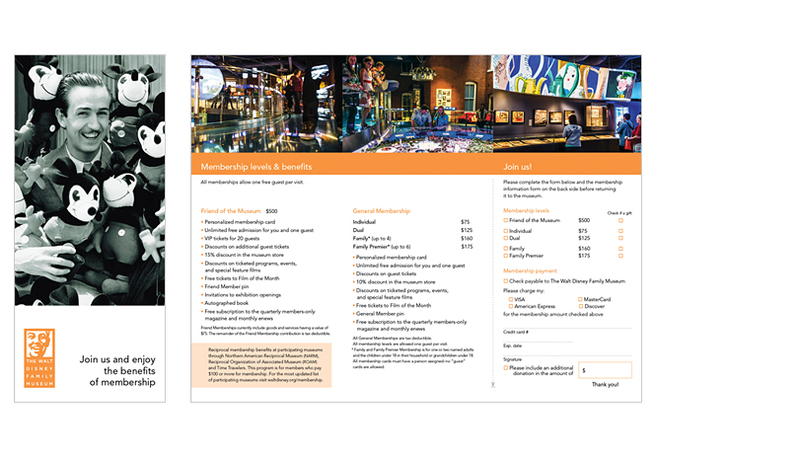 Using Walt’s image to reinforce the branding strategy and showing some of the galleries to entice the visitor to purchase a membership and visit frequently. 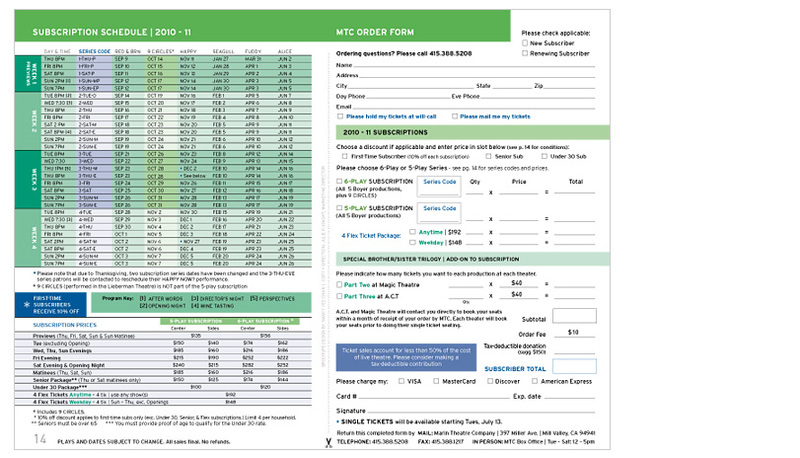 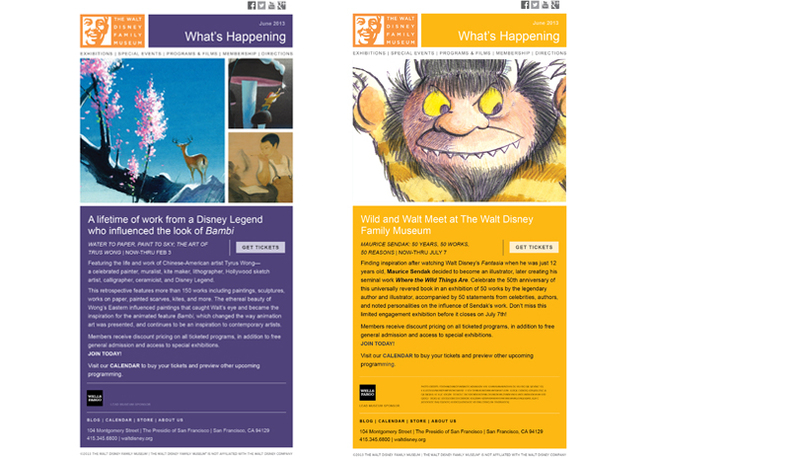 The masthead on this collateral emulates a similar layout to the existing website, as the email forwards the viewer directly to the website for information; the branding color palette is used to enhance each email's specific image and differentiates each email from previous emails. 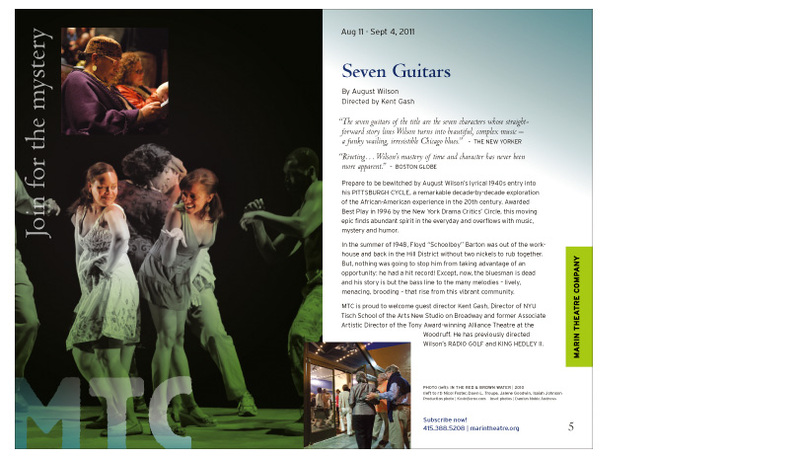 This brochure features past production photos that have been colorized to emphasize the emotional connection that the actors are portraying. 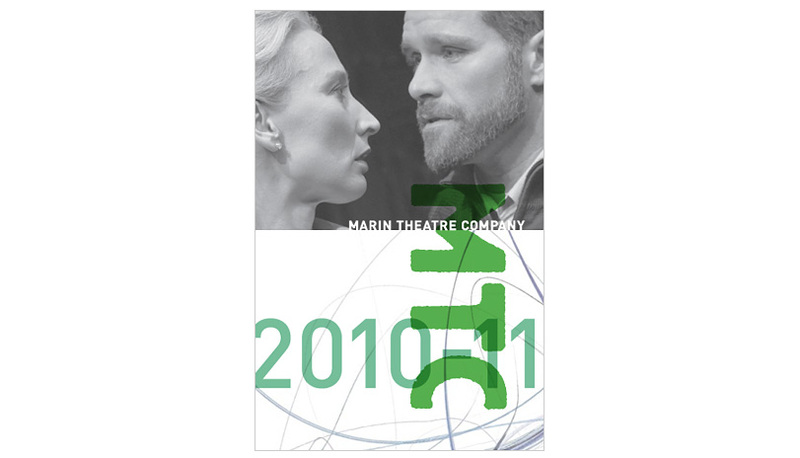 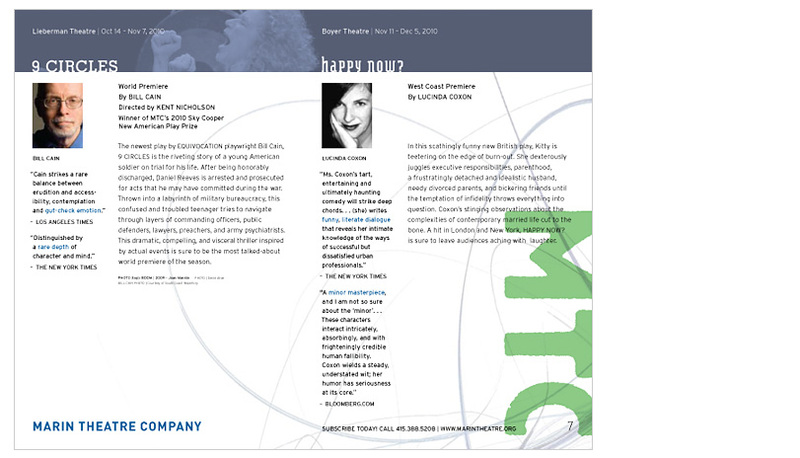 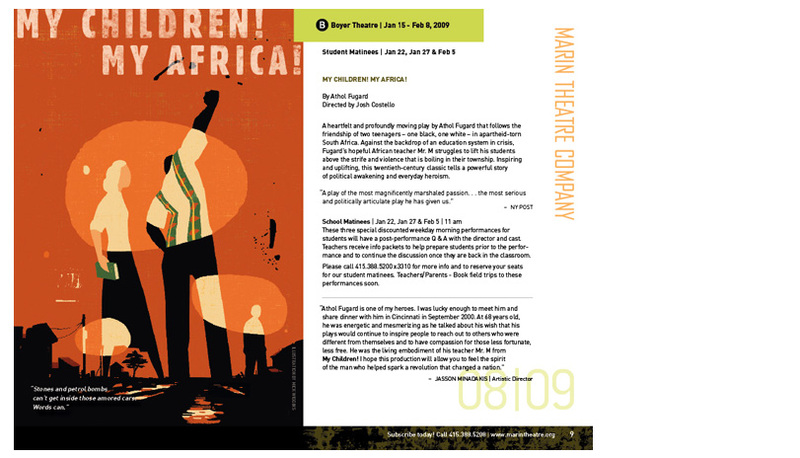 For the 2007-08 season, the theater introduced an expanded season of five main plays and two small stage plays. 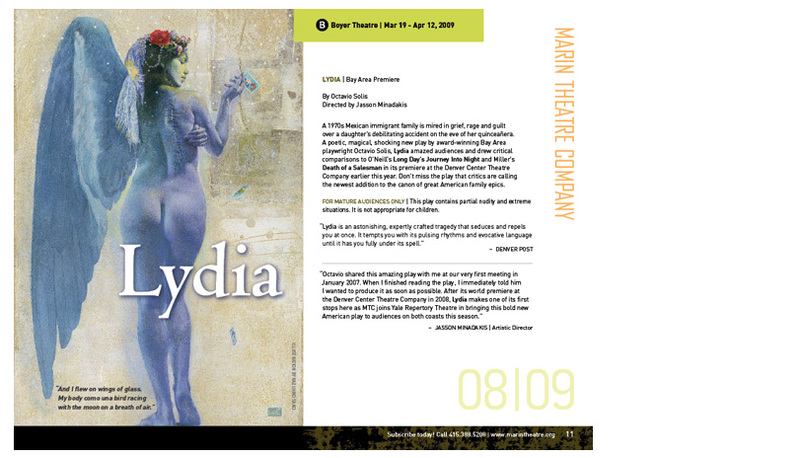 The emphasis for this piece was to inform the patrons about the expanded season and to convey the excitement for the upcoming season. 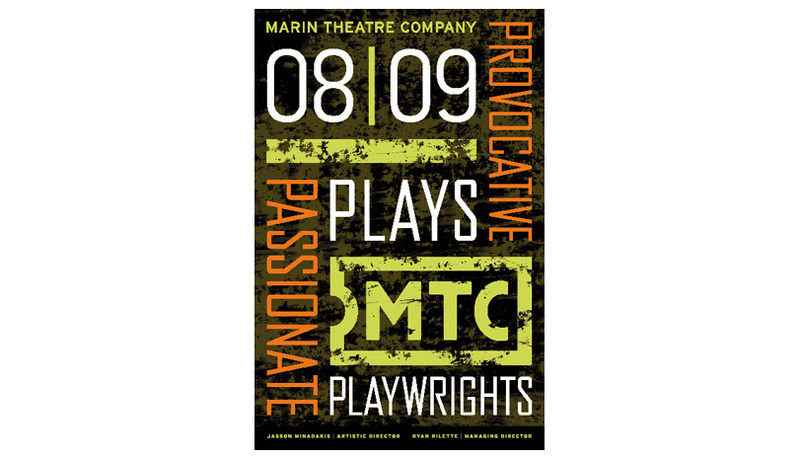 The brochure cover featured a typographical solution that emphasized the theater logo and conveyed a bold, creative feel. 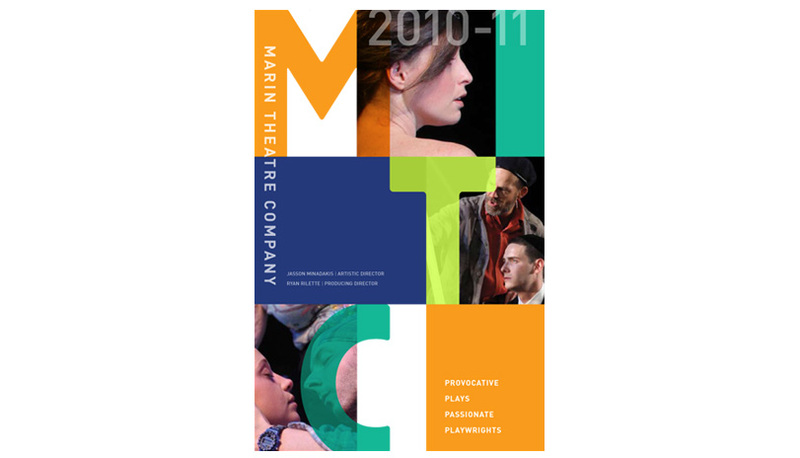 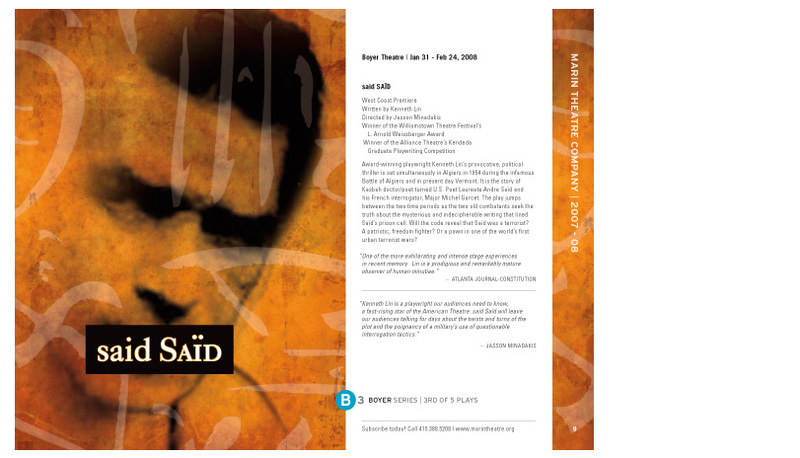 A departure from previous brochures, the production deadline was moved forward and consequently the final play artwork was not available to be included in the brochure. 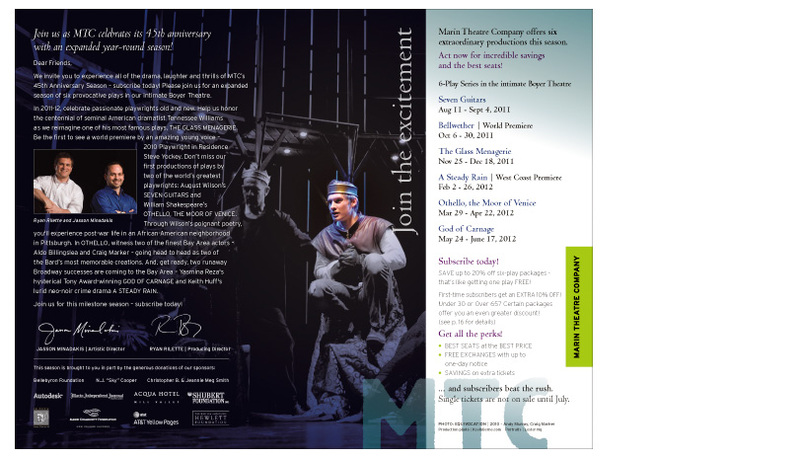 Past production photos were utilized with patron photos to impart the excitement of the theater experience. 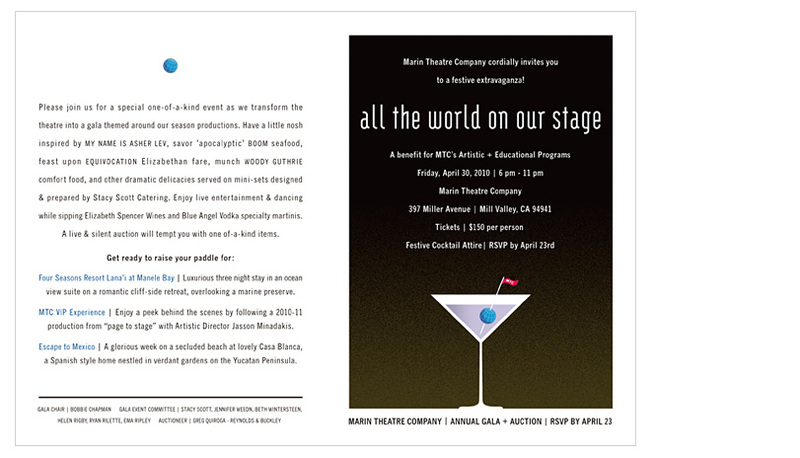 This invitation concept was based on the applause and acclaim at the end of a performance. 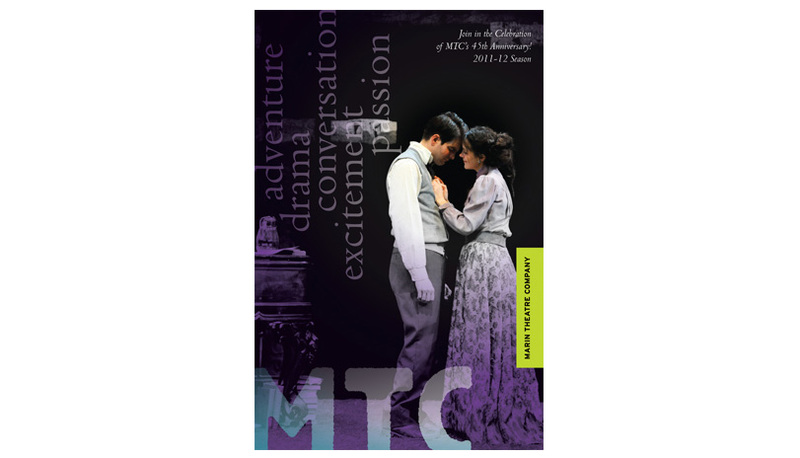 MTC’s artistic director was leaving for a new position and this event was themed in his honor. 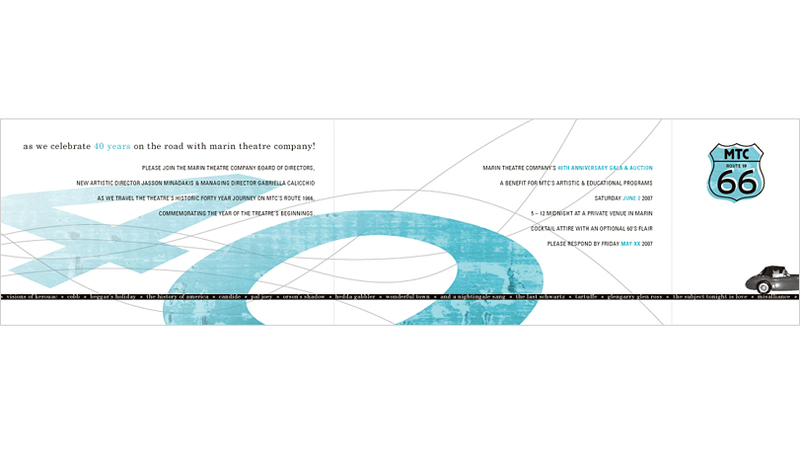 A visual of a rose and corresponding copy helped to reinforce this idea. 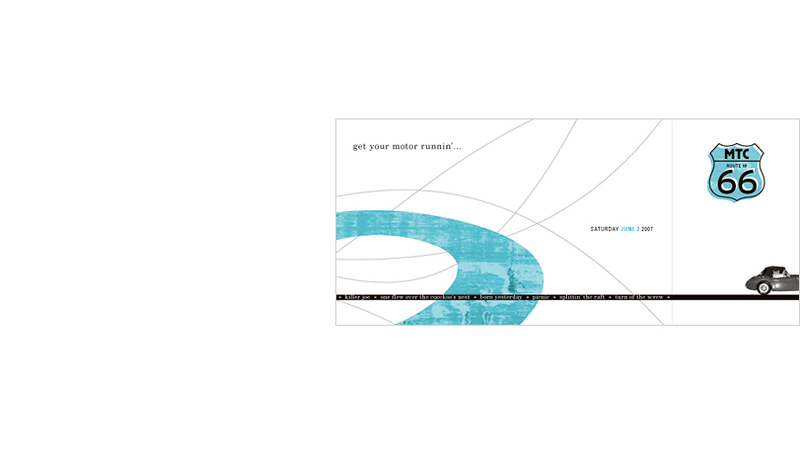 Invitation for a fundraising event that took place at a private car museum in the North Bay. 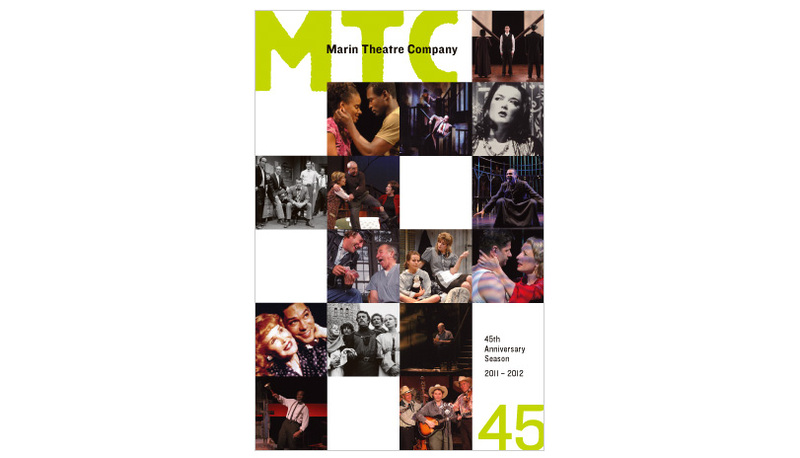 Founded in 1966, MTC celebrated it’s 40th anniversary. 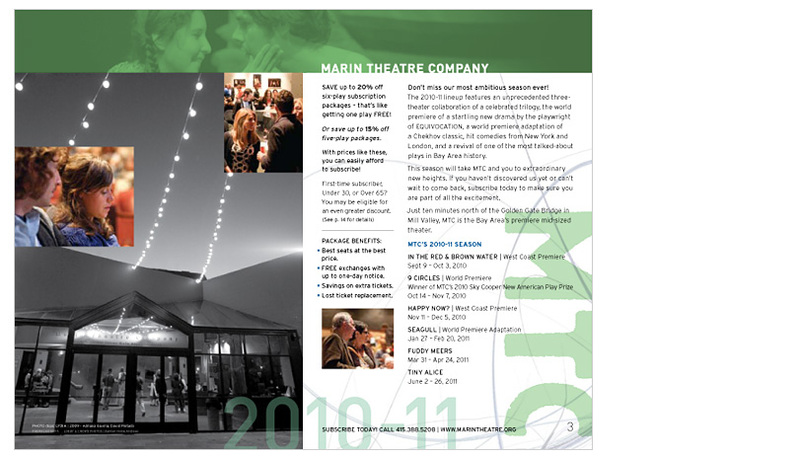 This MTC fundraising event took place at the theater itself. 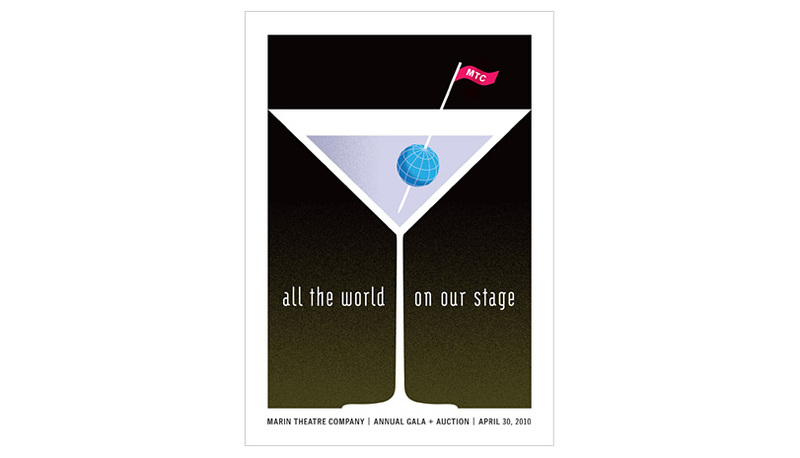 The menu was themed to match the five plays from that season and featured specialty martinis from one the theater’s sponsors. 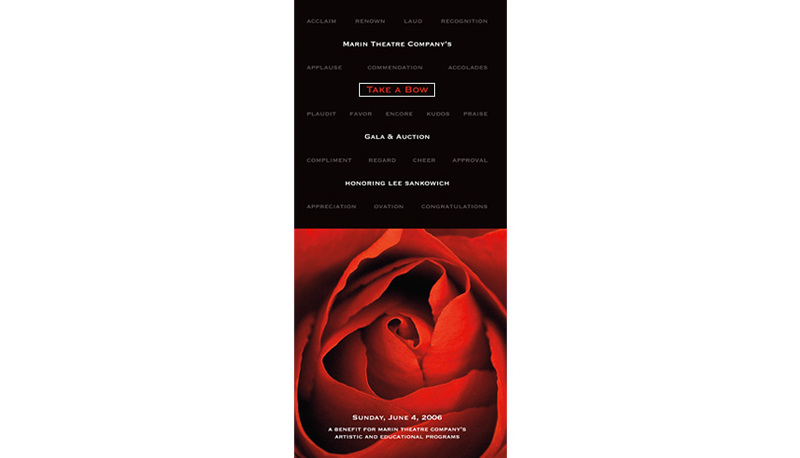 This invitation was designed to highlight an intimate event where the patrons would be seated with a ‘special’ unknown guest for dinner. 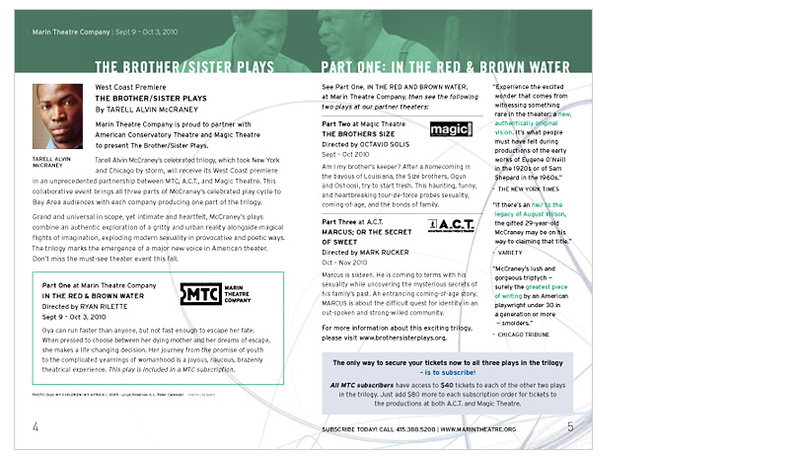 The guests were actors from either upcoming or past productions. 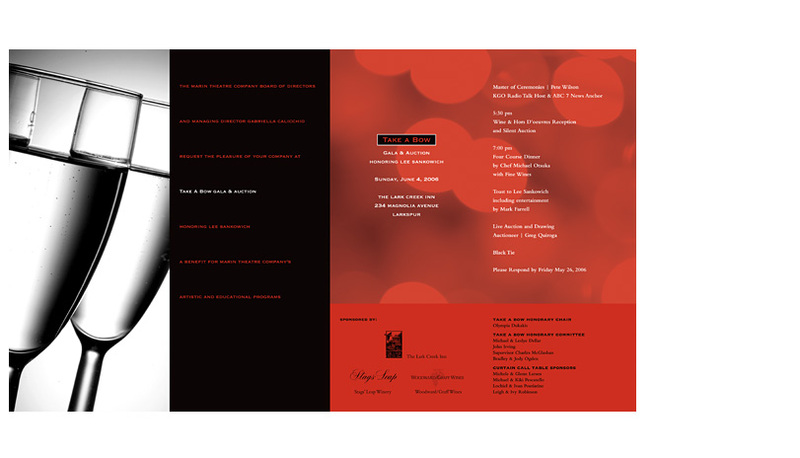 The color pallette reflected the seasonal farm-to-table menu for that night. 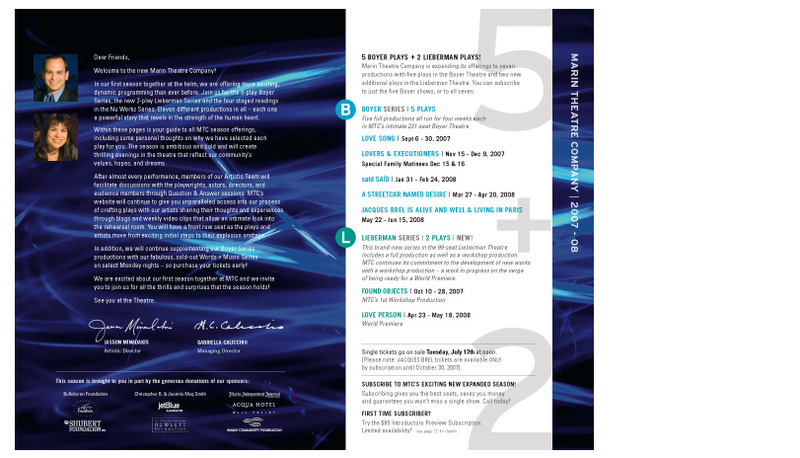 Here are a sampling of the many brochure comps that were created in any given season, but not selected for one reason or another. 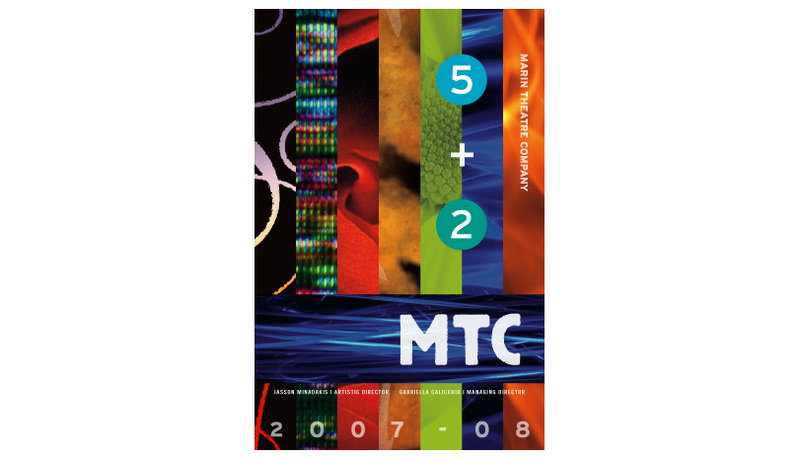 Though not chosen, these comps still strongly convey the MTC brand.